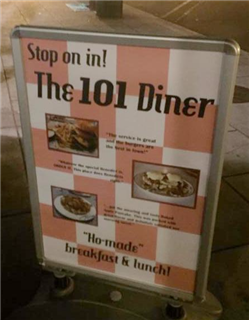 Recently, students in Graphics 2 had an opportunity to gain real-world experience by creating marketing materials for the 101 Diner in Encinitas. The class interviewed Pacific Ridge parent Scott Smith, owner of the diner, to get a sense of the restaurant's vibe, values, and biggest selling points. The student's final designs, honed through several rounds of feedback with Mr. Smith and graphics teacher Mrs. Schmidt, featured elements including excerpts of positive Yelp reviews, food photos, and retro-style graphics. 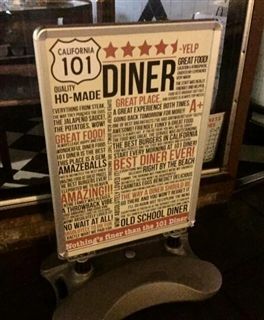 Mr. Smith was so pleased with the quality of the students' work that all 14 designs will be rotated as marketing posters in front of the diner.